With the capability to print, copy, scan, or fax utilizing Brother’s dependable color inkjet technology, the MFC-J460DW offers value and dependability. This all-in-one has an automatic document feeder plus automatic duplex (2-sided) printing for increased efficiency. With a 100-sheet paper capacity, it can handle paper as large as 8.5” x 14”. The MFC-J460DW boasts an easy-to-setup wireless network which allows connectivity to multiple devices, such as desktops, laptops, tablets, and other mobile devices(1). You can print directly from your mobile device by using AirPrint, Google Cloud Print, Brother iPrint&Scan, Mopria, or Wi-Fi Direct(1). Consumers can also scan to and print from popular cloud-based services with Brother Web Connect, including Dropbox, Google Drive, Facebook, OneDrive, and more(2). Capturing and converting documents directly using Brother Cloud Apps is also made easy(3). 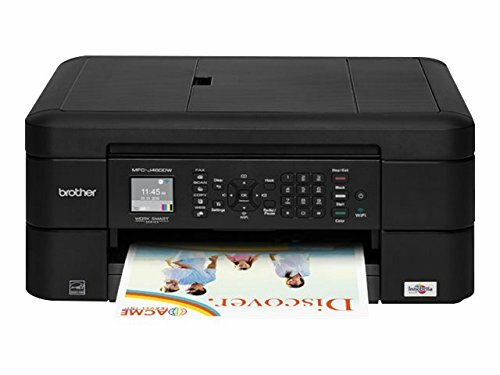 The Brother MFC-J460DW Color Inkjet All-in-One Printer is easy to connect, compact, economical, and loaded with value. The easily navigated onscreen menus feature a 1.8” color display. The multiple connectivity features and mobile access make this system easy to use and help to improve office efficiency across multiple platforms. Brother stands by our products, which is why we offer a 1-year limited warranty plus free phone support for the life of the product. (1)Requires connection to a wireless network. (2)Requires internet connection and an account with desired service. (3)Requires an Internet connection. View More In Inkjet Printers.